Getting ready to backpack through South East Asia we anticipated visiting idyllic islands and traveling to hotspots like Angkor Wat, Chiang Mai, and Halong Bay. We would be visiting ancient temples, witnessing the sunrise over UNESCO World Heritage Sites, and losing ourselves in fairytale landscapes and fascinating histories. Though of all of the truly wonderful destinations in South East Asia, and we did find a special place in our hearts for each country we visited, when it came to Laos, something unexpected happened. We both fell head over heels in love. Maybe we favor Laos because we had no expectations for the country. Like most backpackers, we viewed Laos as a place to visit after our visas expired. A stepping stone to the next country. 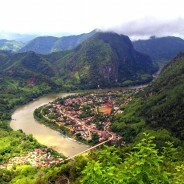 Though Laos proved quite quickly to be a worthy destination in it’s own right; a country which combines some of the best elements of Southeast Asia in one bite-sized destination.